This past weekend was the big garage sale. Randy had sold most of our worthwhile things on Craigslist so most of the items in our garage sale sold for $2 or less. It was a HUGE amount of work to prep. Thanks to Cindy and Darrell for helping us the night before! 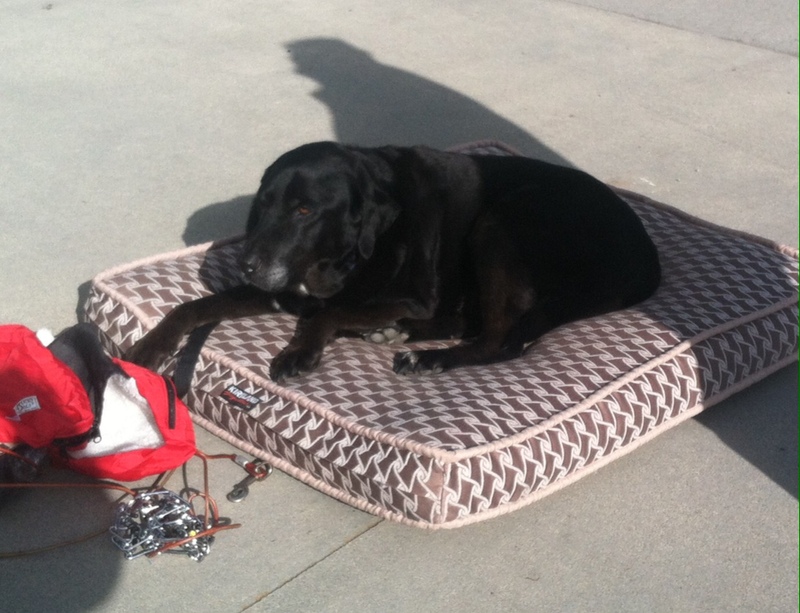 A couple of our $2 items were Elko’s beds (he had 4). He looked a little concerned when two of them came out to the driveway and one sold right away. The second stayed a little while and he eventually went and laid on it as if to say “Don’t sell my bed!” A lady had already seen it and wanted it, so when she was ready, we brought his favorite bed from the house out to the driveway – and did not sell that one out from under him. We survived, got rid of a bunch of stuff and made some money in the process. But – never again! We will never collect 30 years of “stuff” again, and if we do – we’ll donate it. Next step is listing the house. Our bedroom and kitchen are the only normal rooms left. The plan had been to stage the main floor but the local Parade of Homes has all the stagers too busy. We are going for the empty look, which is a good thing since almost every other room in the house is empty. Randy has a variety of small projects to do that are mostly cosmetic and we expect to be ready to list next week. It sounds like you guys are really going for it! We still want to come over to see your new “home” when you are ready. Poor Elko, life as he knows it is rapidly changing. True enough. But when he is with both of us all the time, we think he will love that. Plus, he wants to go where the truck is going, forget the beds.